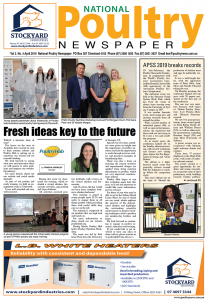 NEXT year in February the University of Sydney – Poultry Research Foundation, in conjunction with the World Poultry Science Association, will host the 30th anniversary of the Australian Poultry Science Symposium. international regard, evident by the increasingly diverse international speakers and delegates. APSS has come a long way since its humble beginnings as a small symposium held solely by the PRF way back in 1968. From there it became the annual PRF symposium in 1983, and then in 1988 it was agreed the PRF would combine resources with the WPSA to organise an annual national conference that would maintain continuity and quality with the established PRF symposia. The inaugural APSS was held on the main campus of the University of Sydney in Camperdown, from February 7-8, 1989. It proved to be a resounding success with strong support received from all sectors of the industry as well as universities, WPSA, CSIRO and state Departments of Agriculture. In particular, the financial support received from the Australian Chicken Meat and Egg Research councils was extremely important in establishing these early symposia, and their contributions have remained steadfast over the entire 30 years of the conference. Attendance has steadily grown, from 50-100 delegates in the early years to consistently between 200 and 250 delegates from 2012-2016. In 2017, the decision was made to move the conference away from the university campus, seeking larger, higher-quality facilities and a greater range of accommodation options for delegates. Sheraton on the Park in Sydney CBD has hosted the event for the past two years and will again welcome APSS in 2019. Though a huge change, the move enabled growth, with delegations reaching a record number of 260 attendees in 2018, and sights are firmly set on breaking the 300 mark at next year’s milestone event. The increased size and prestige of the event has meant continual evaluation and introduction of changes in the conference organisation, however, the principles defined from the very first symposium still operate today. Distinguished invited overseas scientists are supported by many Australian-based academics and researchers, with input also from industry personnel. The Australian poultry industry is advantaged by the research and development, extension and rapid adoption enabled by APSS. In addition, one of the most important services facilitated at the conference is to encourage the future of our industries, our young graduates, postgraduate students and post-doctoral researchers by providing a vehicle for people to meet and communicate. As has always been the case, a major problem relates to finding time to allow the presentation of all submitted papers within the three-day time period of the symposium. Since 2012, the pre-registration and informal Avian Science Forum, which are held on the Sunday evening prior to the official opening of the symposium, have proved to be a great success. The move to Sheraton on the Park in 2017 has afforded a successful re-introduction of a formal Poster Session, which takes place on Monday evening after the first day of oral presentations. By providing delegates with canapes and drinks, and a structured approach to displaying the posters, APSS has achieved a very high rate of discussion and interaction between authors and attendees. The 2019 conference will focus on the overarching theme of ‘Sustainable Poultry Production’. There will be five international and two local invited speakers expounding upon global poultry nutrition, lower protein broiler diets, alternative feed sources, the importance of the intestinal microbiome and antimicrobial stewardship. A special presentation celebrating the 30th anniversary will be delivered by Prof Wayne Bryden, who was heavily involved in the early years of the PRF. A record number of paper submissions have been received this year, and a draft program is now available online, along with registration and accommodation information. We welcome attendees from all sectors of the poultry industry, the poultry research fraternity and anyone with a deep interest in poultry science. After 30 years, APSS is a well-established and world-renowned international scientific meeting that has met and even surpassed the hopes of its founding organisers. Members of both the Poultry Research Foundation and the Australian branch of the World Poultry Science Association should be rightly proud of their contribution to the success of this international symposium, as well as all those who have shown their support through sponsorship and attendance over the years. The 30th anniversary of the Australian Poultry Science Symposium will be held from February 17-20, 2019. Ms Amy Moss and Ms Doreen Anene. Amy won the best student oral presentation (Mingan Choct Award) that was supported originally by the Poultry CRC and is presented annually at APSS for exceptional student presentations. Ms Angela Scott, PhD student who is now working for PIRSA in South Australia, Amy, Doreen and Ms Ha Troung, past PhD student who is now working with CSIRO in Queensland. The PRF supports the Best Student Poster presentation, which is a relatively new concept at APSS. WPSA Australian Branch president Prof Julie Roberts with Dr Chris Morrow who was presented with the WPSA Australian Poultry Award. This award has been presented annually at the conference since 1964.